Family of fallen soldiers Hadar Goldin demands PM work with US to ensure resolution condemning Hamas does not ignore captives in Gaza. 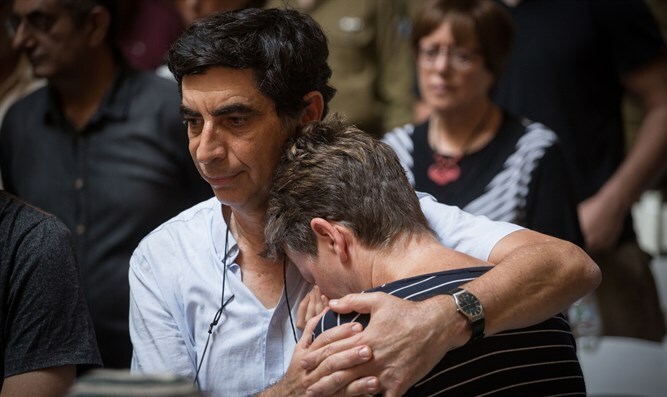 Leah and Simcha Goldin, the parents of IDF officer Lieutenant Hadar Goldin, whose body is being held by the Hamas in Gaza, called on Prime Minister Binyamin Netanyahu to take advantage of his close relationship the American administration and immediately to include the need to return fallen Israeli soldiers and civilians in Gaza in the resolution condemning Hamas which the UN will vote on later today. "In an unusual step, and after much effort, the US administration brings to the UN General Assembly a strong condemnation of Hamas activity in Gaza, and it is inconceivable that such a statement of condemnation would not include the IDF soldiers Hamas holds in Gaza in violation of international law," the parents said. They added that "removing the soldiers and civilians from the condemnation message is contrary to Israeli interests." Therefore, they said, "Netanyahu must act immediately with the American administration and take advantage of his special status so that the condemnation announcement will be corrected." On Thursday afternoon, the UN General Assembly is expected to vote on a bill calling on countries to condemn Hamas and stop its terrorist activities. Israel and the US are working intensively to ensure a majority support for the proposal.